As IT enters the cloud era—where hybrid IT is the dominant deployment model—the capabilities of primary all-flash arrays (AFAs) will need to evolve to handle cloud scale and agility. However, current-generation AFAs have fundamental bottlenecks that both limit their consolidation and cloud-scale capabilities, and create architectural risk as future memory technologies emerge. 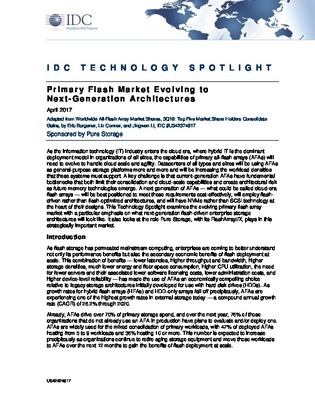 Download this IDC report to examine the evolving primary flash array market, with a particular emphasis on what next-generation flash-driven enterprise storage architectures will look like. Discover how cloud-era flash arrays will meet all cloud requirements cost-effectively, why they’ll have NVMe rather than SCSI technology at the heart of their designs, and more.